This Sunday is going to be spectacular as parts of the Southern Hemisphere will witness 'Ring of Fire' eclipse, as the Moon moves between earth and the Sun and blocks sun completely from sight, creating a burning outer ring. A 'ring of fire' eclipse is actually known as an annular eclipse, and it occurs same as a solar eclipse, the Moon moves in between the Sun and Earth as it orbits around our planet. It will be visible for those in southern South America and southern Africa, but it doesn’t mean that other people in the world will miss it. They also can watch it via the Slooh livestream (embedded at the end of the article). The live stream starts at 7am EST on Sunday, 26 February with the eclipse making arrival in southern Chile around 10 minutes later. It is not same as in the case of total solar eclipse, as moon is too far so it wouldn’t be able to hide the sun completely behind it, hence it leaves a thin ring of burning solar plasma visible. C. Alex Young, a solar astrophysicist at NASA, told New York Times: “Because you have this thin little ring around the edge of the Moon where the Sun pokes out, it gives it that ring of fire effect”. The reason the Moon is too far from us at the moment because its orbit is elliptical - this Sunday, the Moon will be close to its greatest distance from us, known as its apogee. Still, our Moon will manage to block around 99 percent of the Sun for everyone under this path, commonly known as the path of annularity. On our planet where Moon’s shadow cast, it can be anywhere between 29 and 89 km in width, is called as the path of annularity. 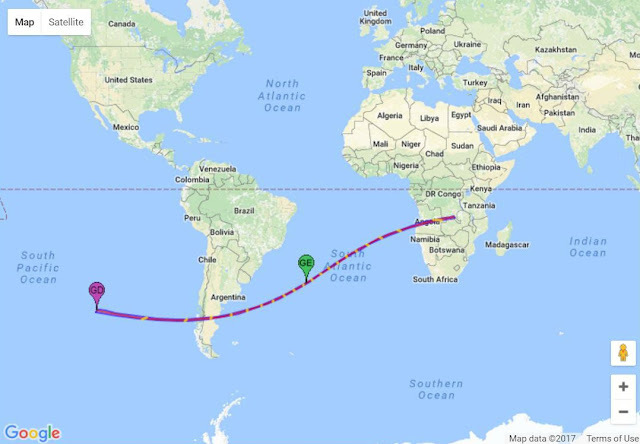 The timings for eclipse are divided like this, it touches down in Chile around 9.10 am local time before moving into Argentina and then travelling eastwards across the Atlantic to touch down on the African nations of Angola, Zambia, and the Democratic Republic of the Congo around 160 minutes later. According to Young, skywatchers in Argentina will get the best view as compared to all other viewers. Those in the Democratic Republic of the Congo will also be able to see an incredibly rare and beautiful sunset. Joe Rao for Space.com said: “Instead of a reddened ball, the Sun will resemble a fiery hoop”. People those are not in the path of annularity will also see some of the sights as lower two-thirds of South America, western and southern Africa, and most of Antarctica will be able to see a partial solar eclipse. Slooh has a network of observatories it works with, and it is the best of it for a perfect view, so those of us watching online will be able to experience the ring of fire, too. NASA has already warned those who are going to watch it in person, and recommended pinhole camera or solar viewing glasses - just because most of the Sun is blocked from view, doesn't mean it can't still damage our eyes. As most of the best viewing spots are already booked, so you have to start planning soon to get the best of it, and all the details you want are available here.